Since 1924 we have grown to be a leader in both residential and commercial heating and cooling in Central Ohio. We offer installation, service and heating repair. Our services also include emergency heating and cooling repair to homeowners and businesses in Columbus, Dublin, OH and the surrounding areas of Central Ohio. We offer a wide range of HVAC services in Columbus, Dublin, OH and the surrounding areas. Our technicians are highly experienced in heating repair, air conditioning repair, furnace repair and emergency heating and cooling repair. If you need a new system, or want to upgrade to an energy efficient Carrier heating and cooling system, call Favret Heating and Cooling for outstanding service at affordable prices. We install a wide range of heating and air conditioning equipment in homes and businesses throughout Central Ohio. You can also pay your bill online and find special offers and discounts in our Web Offers section. Stop in to visit our Columbus showroom or call 614-488-5211 for more information about our expert services. Whether we've done a great job or not so good. We want to hear from you. 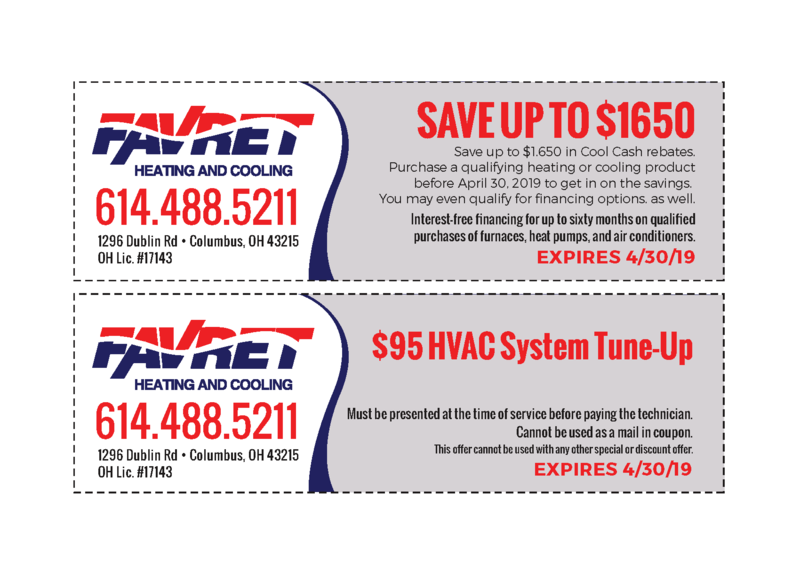 Favret Heating and Cooling values you as a customer and wants your feedback, so we can improve our products and services.